The relationship of the human body to clothing — and, by extension, to fiber — is inherently intimate. 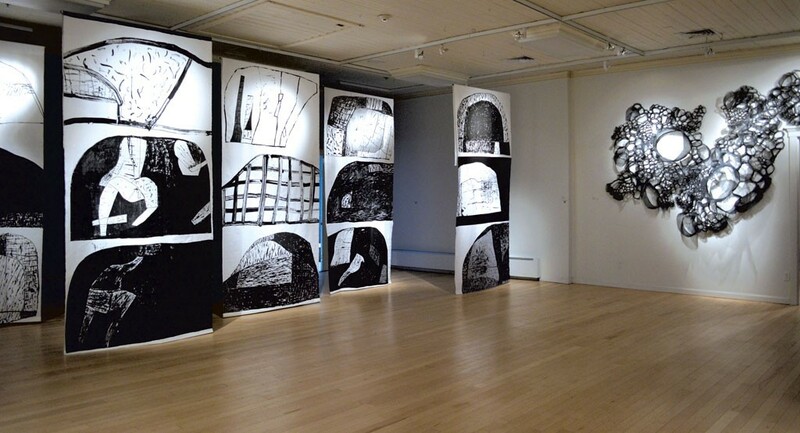 Now on view at the Helen Day Art Center in Stowe, the aptly titled exhibition "Intimacy + Materiality" is an investigation of contemporary work by 13 artists who use textiles to shape dialogues about labor, physical bodies and artistic embodiment. 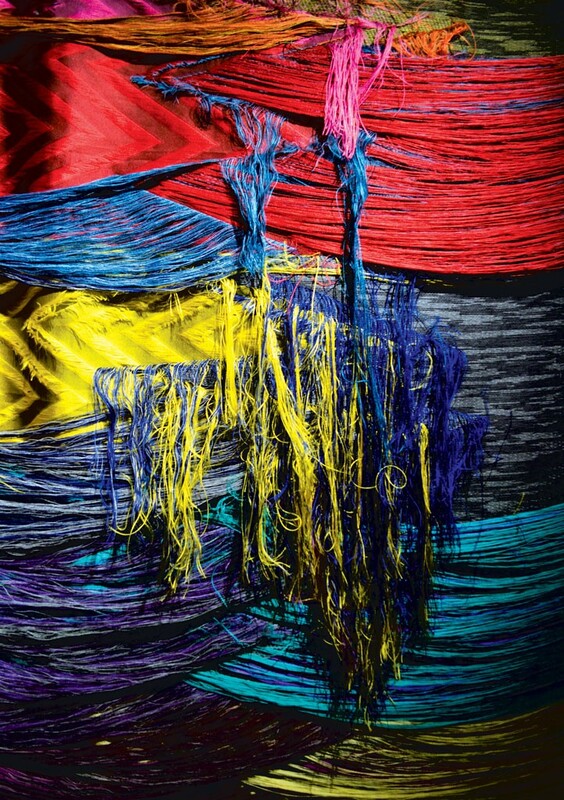 Curated by Rachel Moore, the show emerges from the already richly layered contexts of fiber art. Fabric is the ubiquitous barrier between our naked skin and the eyes of others. Stitching and weaving serve as metaphors for connectedness. And, historically, textile production has been considered "women's work," closely related to the domestic sphere. In contemporary art, artists claiming new visions of feminism and labor relations have imbued soft sculpture and fiber arts with social commentary on accessibility, challenging existing hierarchies of artistic value. In this exhibit, Vermont artist Wylie Sofia Garcia's "Cloaking Device" most straightforwardly invokes textiles as a medium for hiding and transforming. The work is a fully felted garment constructed from brightly colored wool triangles, pieced together as in quilts. Described by Moore as "plump, detailed sculpture," Garcia's "device" is inviting even as it proclaims itself a tool of isolation. It provides the linchpin of Moore's thesis about the versatility of textiles as they relate to the human body. Garcia's second piece, "It's Not That Simple," is a large-scale, abstract soft sculpture protruding from a gallery wall. If "Cloaking Device" emphasizes externality, this work references what goes unseen. Composed of an eccentric multitude of vibrant fabrics and ribbon trim, its rounded, bulbous shape suggests a deliberately haphazard rendering of an internal organ, or even an individual cell gone rogue. As its title hints, this defiant, angry, exploding work semi-masquerades as merely a feat of patient craft. Cellular structure and biological imagery are plentiful throughout this exhibition. Organic form is the basis of works by Emily Barletta and Jodi Colella and, to a lesser extent, of ones by Sarah Amos and Kathleen Schneider. Based in Brooklyn, Barletta has received wide recognition for her stitched-paper works, six of which are on view at Helen Day. Her repetitive, boldly geometric shapes create whole units that are soothing and pleasant, bordering on hypnotic. Acknowledging the oft-overlooked traumas of everyday life, Barletta writes, "The needle allows me to create a mental space slower than the rest of the day ... creating delicate worlds that are softer and kinder than this." Her "Pelt" reads like a three-dimensional extrapolation of one of these untitled stitched pieces. Small crocheted units, roughly spherical and each with a small opening, are bound together to form a single wall-hung structure. The bright red wool augments the anatomical nature of the piece. By labeling the distinctly interior-centric work "Pelt," Barletta denies the usual separation of a body's inside and outside. Somerville, Mass.-based Colella similarly engages heavily in geometric repetition and playfulness of scale. "Hive," "Mesothelia" (the first layer of cancerous cells caused by asbestos) and "Undercurrent" are large wall hangings made from aluminum screen and steel wire. While these works resemble biological cross-sections, or maps, Colella's felted soft sculptures, "Blast II" and "SPAWN," might have been extracted from those larger infrastructures. The colorful specimens are simultaneously alien and vaguely human. 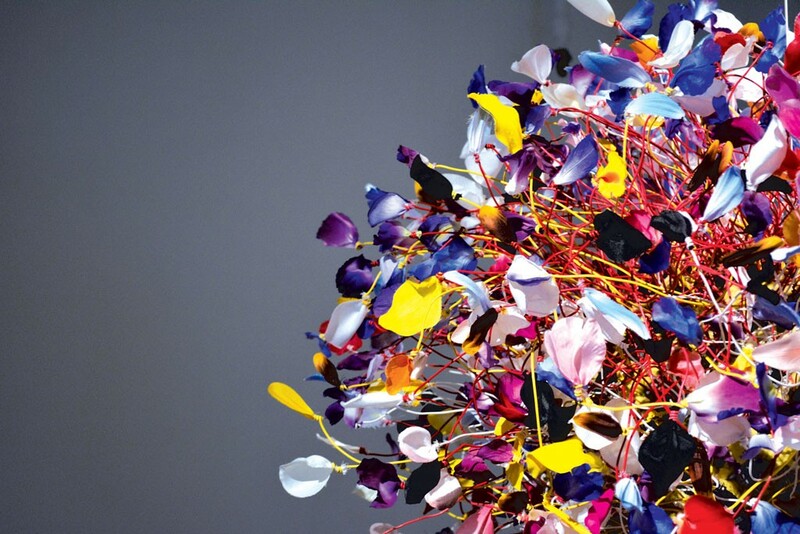 Schneider's "Portrait (Monster Beauty)" is a jubilant concoction of artificial flower petals and colored wire. Like Garcia's "It's Not That Simple," this work has an underlying logic that is not readily apparent, but its wildness manifests itself immediately in the sheer volume of wayward wire. Mike Andrews and Liz Collins embrace irreverence in their own ways. Andrews, who teaches at the School of the Art Institute of Chicago, merges the lo-fi aesthetic of knitting and weaving with video in the installation "Next Pump 300 Miles." Handmade articles of yarn in various states of completion are draped from a wooden, billboard-like structure. This partially obscures a mounted television, which plays a loop of Andrews' animation. Collins' jacquard wall weavings, titled "Euphoria" and "Grief," are deceptively chaotic. Masses of loose ends suggest the works may be unfinished or permanently damaged, but closer inspection reveals them to be intricately designed and crafted. Collins' ceiling-hung tapestry "Belly of the Beast" recalls Toronto-based feminist artist Allyson Mitchell's focus on constructing immersive, "gestational" spaces. One side of the weaving features inviting, loosely woven threads in scalloped formation; the other side has sharp, diamond-like markings. The banner paintings of Chicago-based artist Fraser Taylor also gesture toward physically enveloping the viewer. "Black Holm" is by far the most starkly imposing work in the show. It consists of five ceiling-hung screen prints that feature four abstract black-and-white compositions. Each of these represents an island in Taylor's native Scotland. Viewers are encouraged to walk among the hangings, as a close viewing is rewarded with warmer details, such as the fabric's frayed edges or a stray smudge of scarlet paint. Cofounder of the CLOTH, a 1980s interdisciplinary design collective in London, Taylor has extensive experience in high fashion and graphic design. Both shine through here. Most of the works featured in "Intimacy + Materiality" evoke labor by way of their construction, as products of time-consuming and detailed handwork. The collaboration of Rebecca Purcell, J. Morgan Puett and Jeffrey Jenkins, however, offers a different approach. Echoing the 20th-century "archetype" portraits of German photographer August Sander, "HumanUfactorY(ng) Workstyles: The Labor Portraits of Mildred's Lane" uses nostalgic set dressing to craft humorous and semi-surreal portraits of workers. The artists have invented designations such as "Ambassador of Transhistorical Agency," "Cabinet Minister Peregrinator" and "Master of Applied Complexity." The portraits use elements of religious iconography, including symbolic objects and mandorla-like framing. Given that "Intimacy + Materiality" comes on the heels of Helen Day's "Fractured: Works on Paper" exhibition, it might seem that curator Moore is on a material-focused kick. Fortunately, she is skilled in using medium to express deeper connections — in this case, between fiber and physicality — and the show does not feel strained in the slightest. The original print version of this article was headlined "Stitches in Time"